GBPUSD is under the influence of Article 50 launch and the UK PM May’s speech. 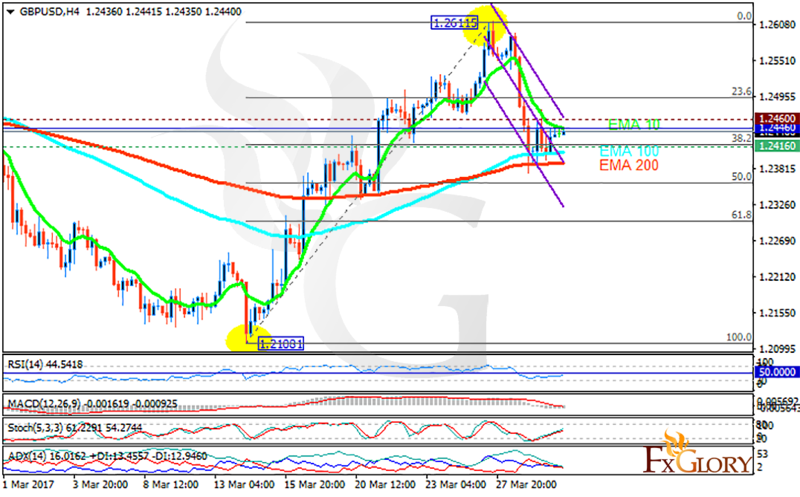 The support rests at 1.24160 with resistance at 1.24600 which the weekly pivot point at 1.24460 is located in between the lines. The EMA of 10 is moving with bearish bias along the descendant channel and it is above the EMA of 200 and the EMA of 100. The RSI is rising towards the 50 level, the Stochastic is showing upward momentum and the MACD indicator is in negative territory. The ADX is not showing any clear signals. The indicators are presenting contradictory directions therefore, traders can wait for a better chart setting. The support level breakthrough will smooth the way for further decline targeting 61.8 level of Fibonacci, otherwise, the pair will start its growth.